This Chewable formula is ideal for those who have difficulty with swallowing tablets. Getting enough calcium is especially important for men and women over 50, during pregnancy and breastfeeding, and during and after the menopause. 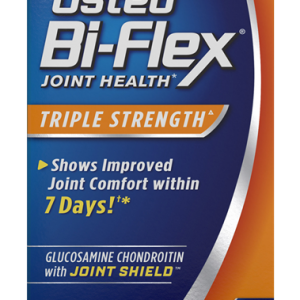 Osteocare is the UK’s no.1 bone health formula and has been scientifically developed on the basis of the very latest research to provide a rich source of calcium and co-factors including vitamin D which helps with the normal absorption of calcium by the body in a great tasting orange & peppermint chewable tablet. 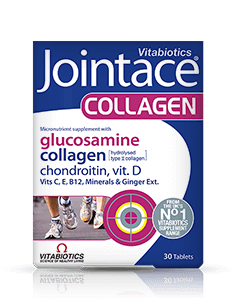 Osteocare Chewable contains the preferred D3 form of Vitamin D. Vitamin D3, also known as cholecalciferol, is the form of vitamin D that is produced by the skin on exposure to sunlight. D3 is the preferred form of vitamin D because it is the specific form made in the human body and therefore more effective than D2 which is found in some supplements. 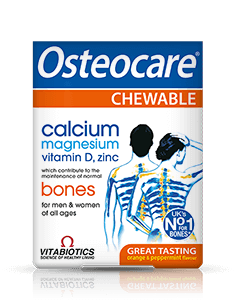 Osteocare Chewable provides 100% NRV (Nutrient Reference Value) of calcium carefully combined with co-factors including vitamin D, zinc and magnesium which help to maintain normal bone health.